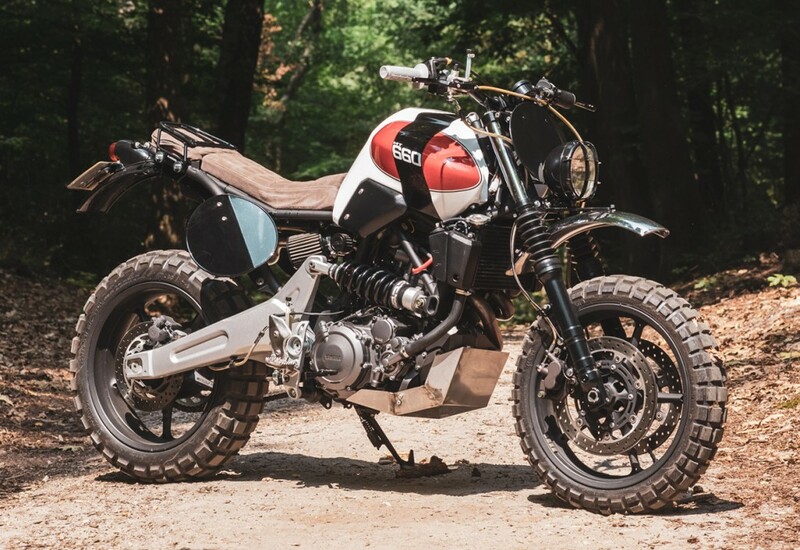 A Yamaha MT-03 Scrambler inspired by the legendary XT500! 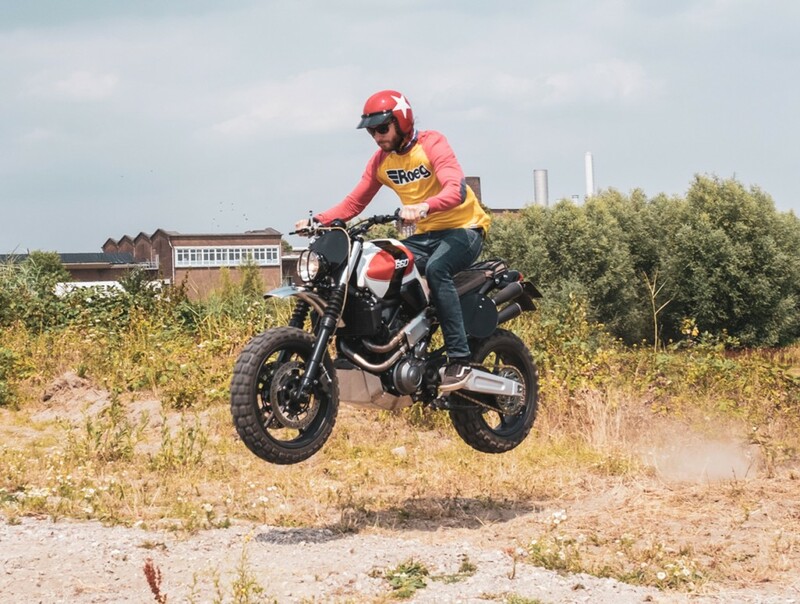 The very day we first spotted this Yamaha “MT660” scrambler — now more than a year ago — we fell in love. 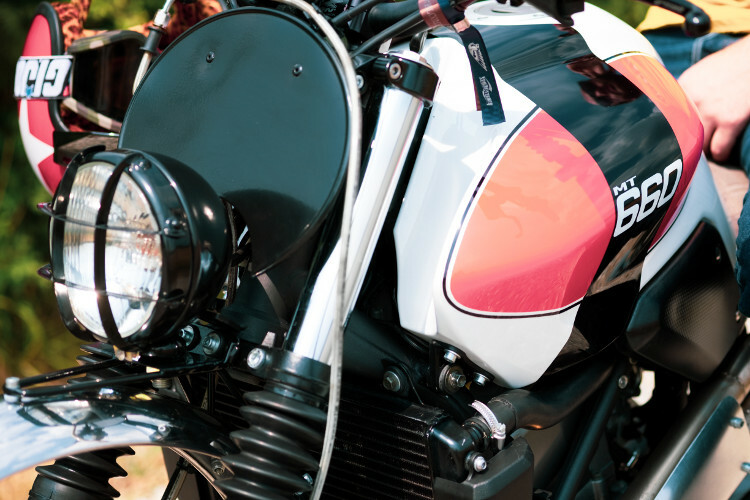 Immediately we contacted builder Roy Holtman of RH Motorcycles to see if we could feature the bike on the blog. For the last twelve months, we’ve prodded and badgered our new friend in the Netherlands to send us photos and information about the bike. Today, we are thrilled to finally introduce his “MT660” to the rest of the world! The build is inspired by the legendary Yamaha XT500, one of the most beloved four-stroke enduro bikes ever built. 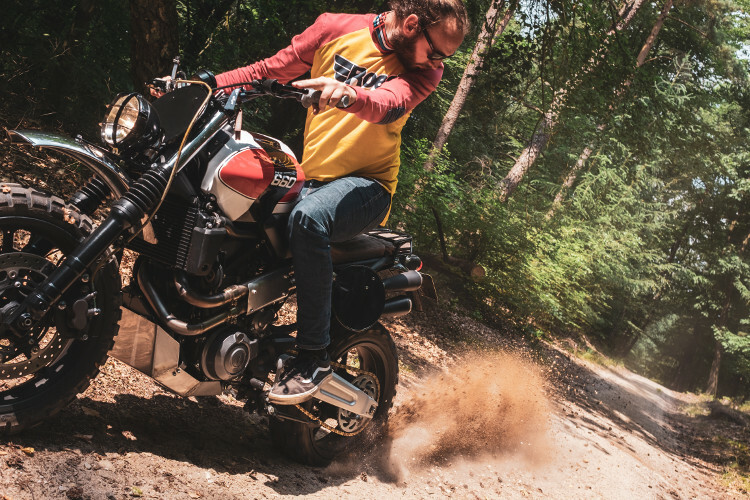 Sharing the same engine as the Yamaha SR500 and TT500, the XT500 won the Paris-Dakar rally and laid the groundwork for the entire XT series, ranging from the minuscule XT125 to the Yamaha XT660Z Ténéré adventure bike. 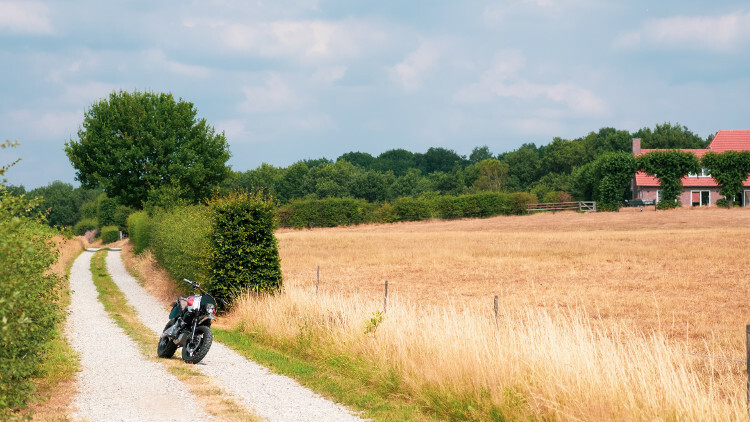 Unlike a lot of modern scrambler builds, which would struggle to conquer anything more bumpy than a fire road, Roy built this big single to perform. 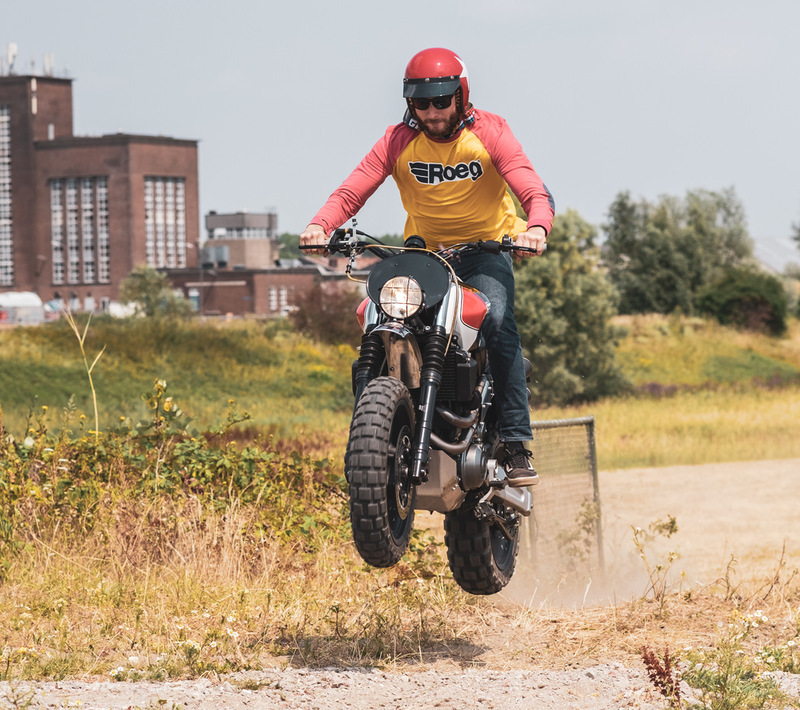 The bike has a burly bashplate, pro-tuned suspension, full fenders, serious brakes, a grippy suede seat, and a high-mount exhaust that won’t get ripped away by roots, ruts, or rocks. As you can see from the photos, Roy isn’t afraid to air out this big single brawler either! 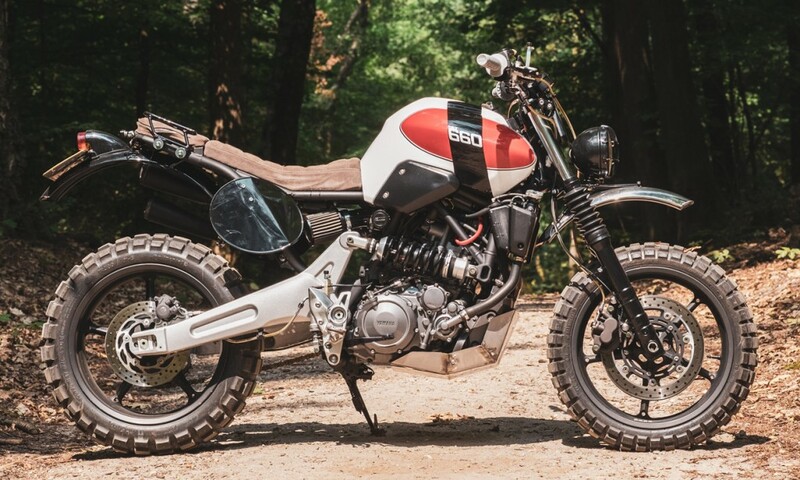 Below, we get the full story on how RH Motorcycles transformed the naked road bike into a modern scrambler, dubbing this build the “MT660 Scrambler” in honor of that 660cc XT engine. Over 40 years ago, Yamaha released their XT500 in 1976, still seen today as one off the most legendary offroad motorcycles ever produced. 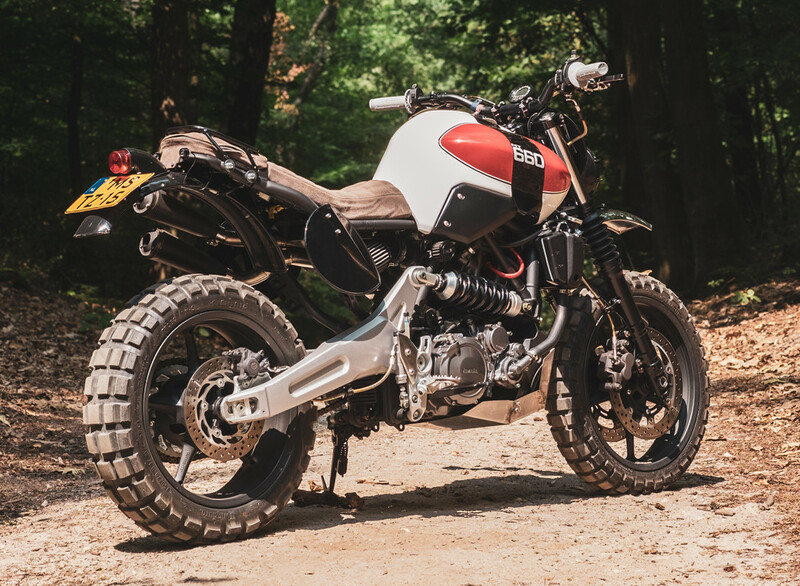 With the modern day factory scrambler trend, we redesigned and rebuilt a Yamaha MT-03 factory stock road bike in honour of Yamaha’s first offroad motorcycle, the legendary XT500. The earlier models of the Yamaha MT-03 came with a 660cc single cylinder engine, the same engine used in the XT660 Z and Tenere. These models, as XT’s, are directly related to the original XT500. This also makes the MT-03 one of the youngest relatives in the XT family tree. As a naked road bike, you could view the MT-03 as the odd stepbrother of the family. 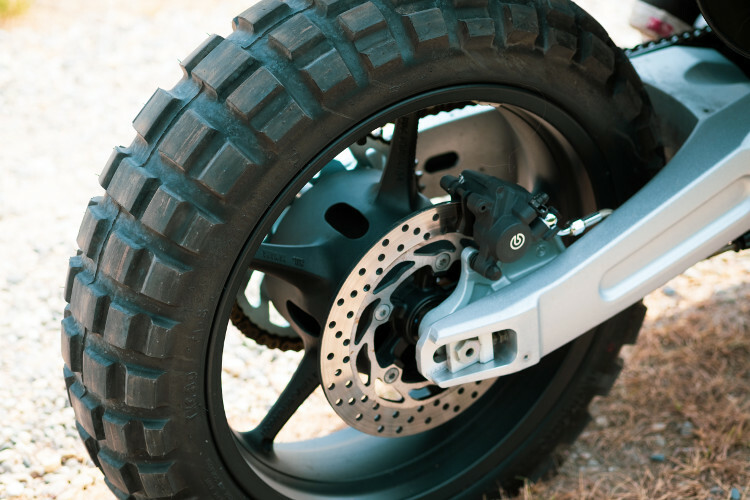 It takes more than just aesthetic changes to re-design a road bike into an offroad capable machine. Of course, keeping the original chassis still makes the bike top heavy at its front end, and will never compare to a dirt bike. 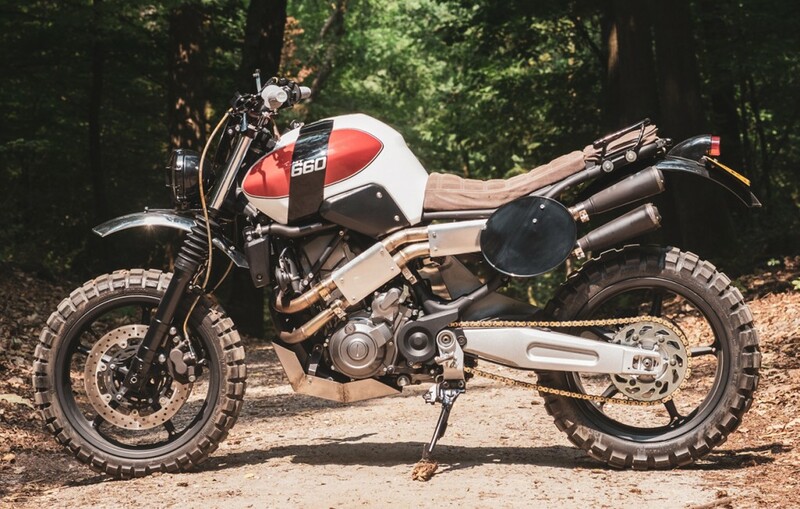 But the concept was to honour the XT by a modern scrambler, and this worked out great! After updating the suspension with a full Wilbers set front and rear, calculating and mounting the right radial Brembo master cylinder to match the calipers, making a custom RVS exhaust with Supertrapp mufflers and adding DNA high flowing filters and a DynoJet Powercommander to get the mixture adjustments right, the bike is more powerful then ever and has a crispy throttle response thanks to its new Dynamo throttle assembly. It brakes as it should, and has an overall better drivability. 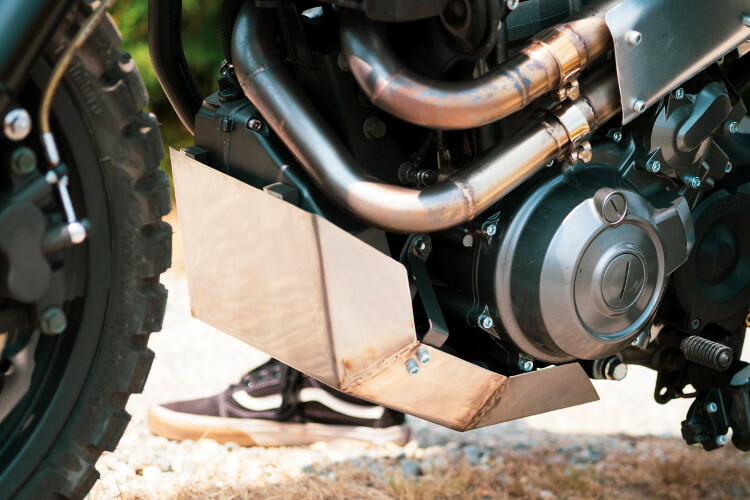 To get the right balance between old school offroad and the modern scrambler design, we mounted RVS fenders front and rear. We kept the front blank for a more retro look and mounted it on a 80’s inspired offroad/enduro bracket. 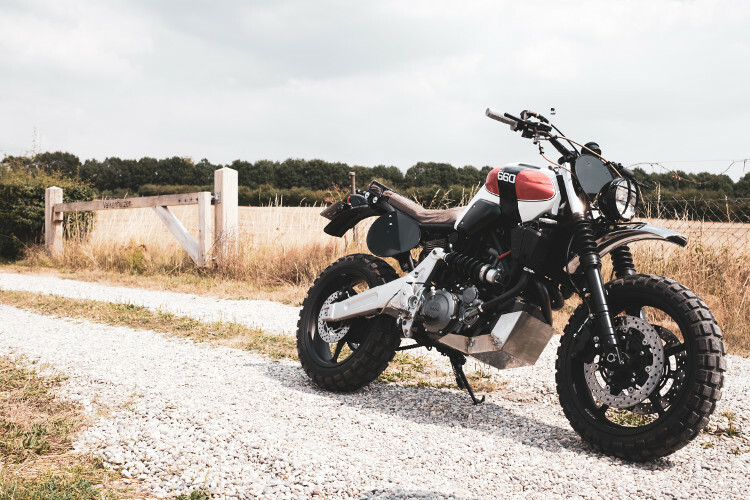 Scrambler headlight, XL offroad footpegs, stoneguard, and Nekken barclamps, bars and grips perfectly fit the offroad theme. The Miller seat is done in grey suede, as suede has better grip characteristics then normal leather. The stitching is inspired by the knobby tires. 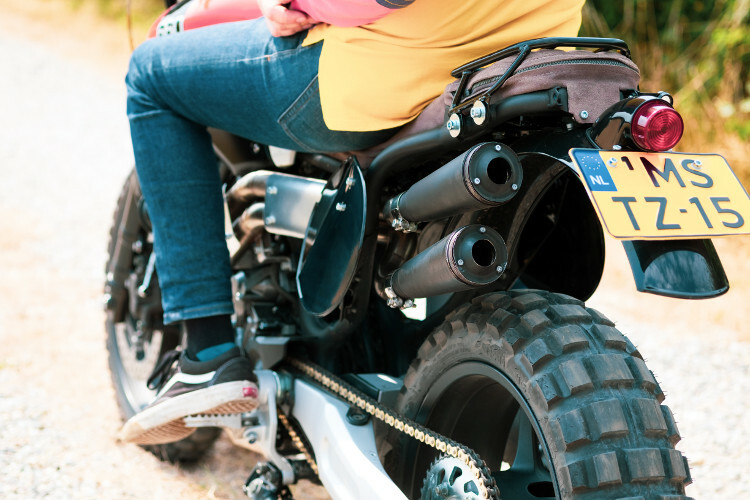 The utility saddlebag just behind the seat is inspired by the bags introduced on 80’s and early 90’s offroad bikes. It functions for storing a small toolroll or lock, and also functions as a passenger seat after fitting a piece of foam made to fit the bag. The little luggage rack mounts right over the utility bag and can hold your tent or tarp and hammock. We kept the original plastic tank as a nod to modern enduro bikes, and redesigned and tweaked the 76’ XT500 graphics to fit the tank. 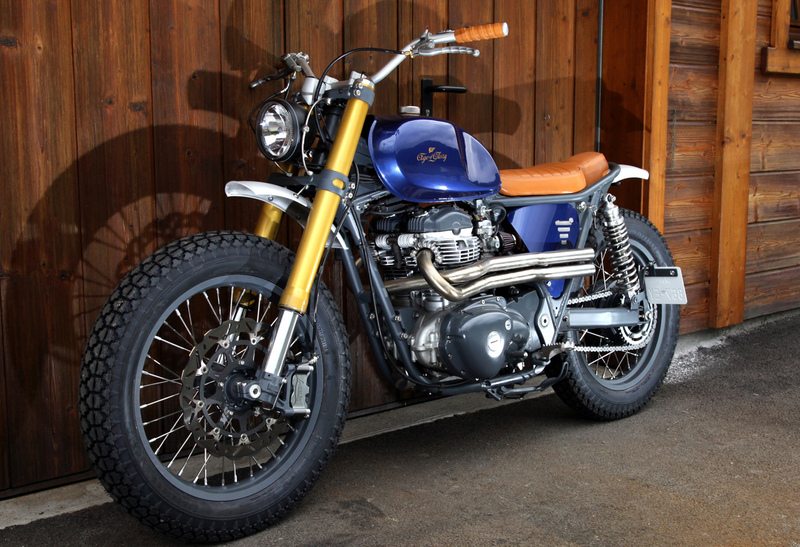 Last but not least the bike comes with a set of Continental TKC 80 tires to complete the style! 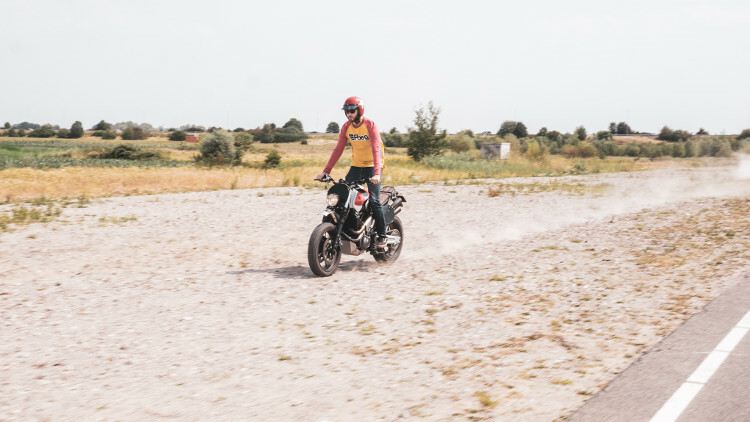 Roy Holtman is the owner and builder of bespoke custom motorcycles at RH MOTORCYCLES, a motorcycle atelier situated in the Netherlands. 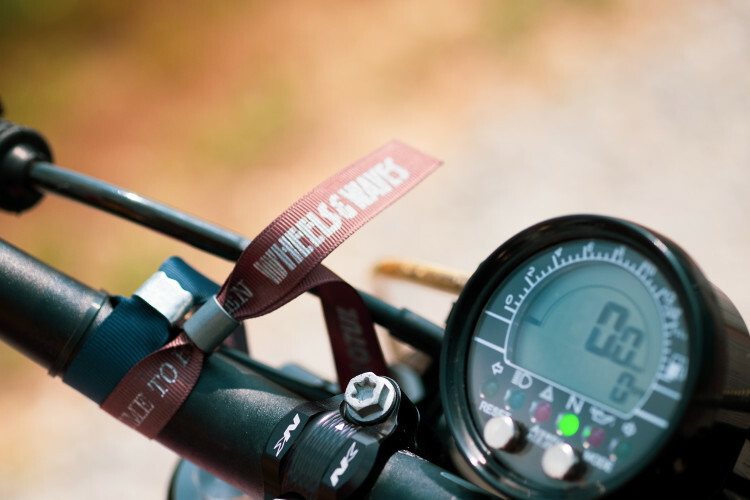 With an education in art and design, and a life long love and passion for the two wheeled machines, these bikes are built with an eye for detail and technical support for the true venturer. 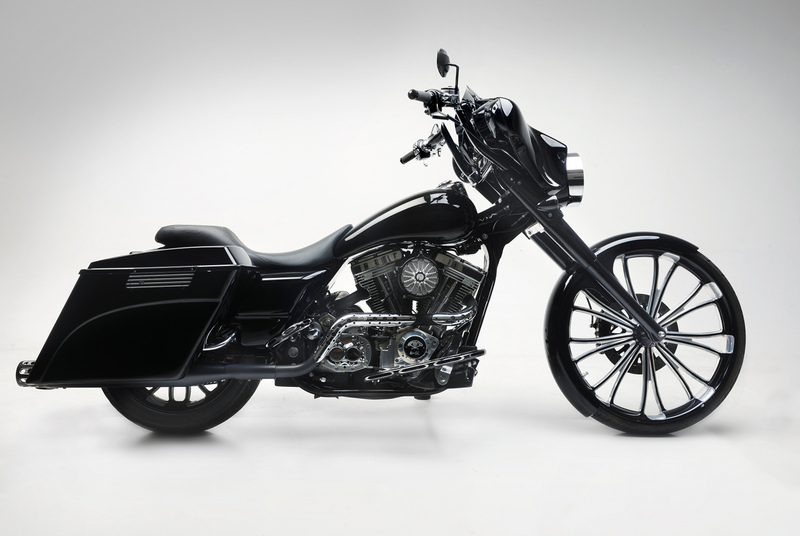 Specializing in handbuilt, bespoke, custom motorcycles and parts. 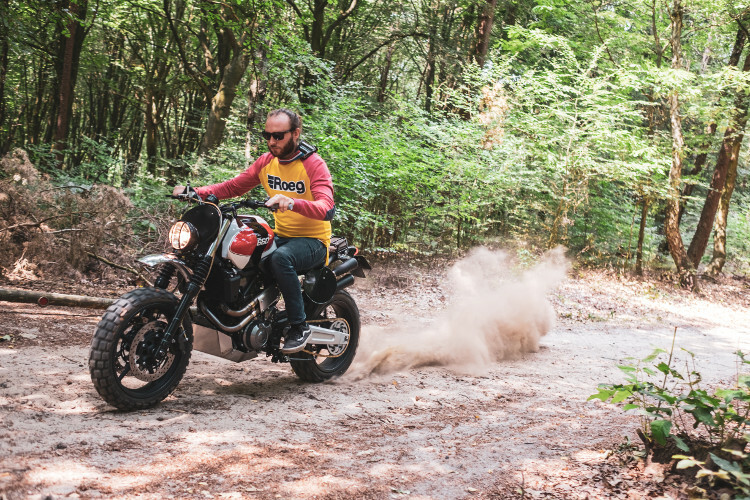 They are passionate about building your next rugged ride. All work is done in shop, and by a network of specialists. The signature “ARE AGE” brand logo is a self-deprecating reference to the Dutch accent when pronouncing the initials of his name. That monstrosity has nothing to do with an XT500. If you wanted to honour an XT500, you should have started with an XT500! Excellent build in my opinion.Very usable. Looks like a capable bike but should not in any way be compared to a XT 500. There are no similarities. 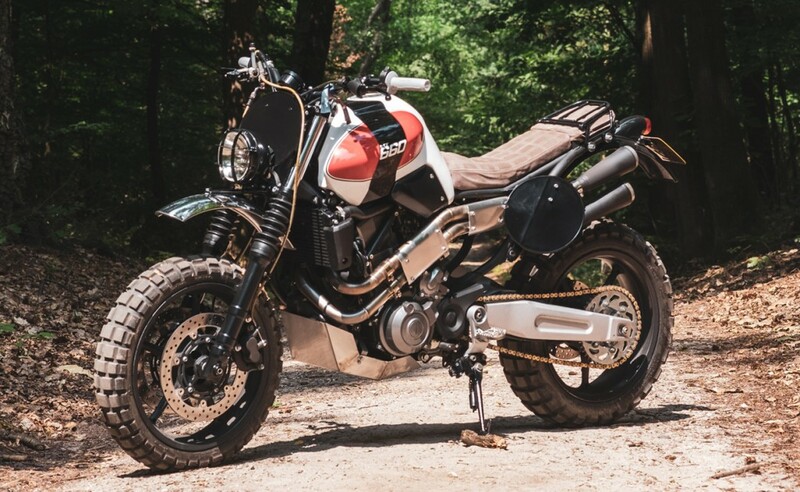 A great build in its own right – just not sure how capable those alloy rims will be off-road vs spoked rims? The word is inspiration. That is how this machine was born. 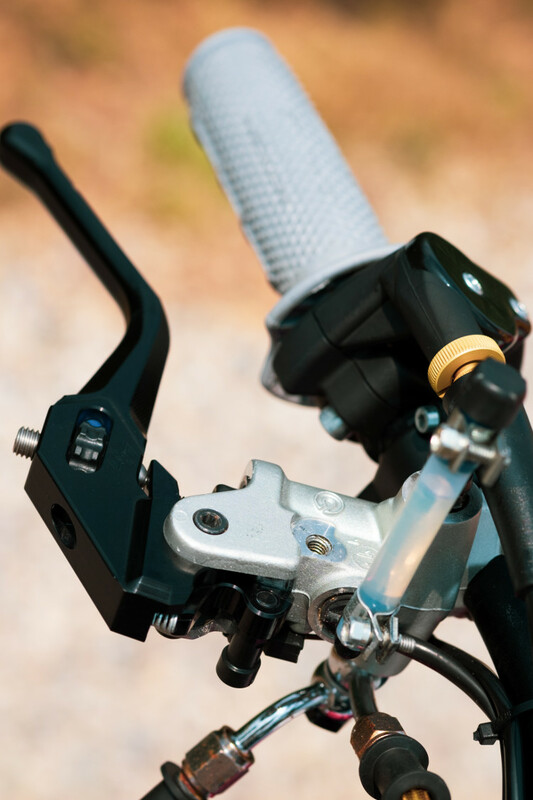 Many of you want to criticize, but what you don’t understand is that bike builders need a spark, that moment of clarity that allows them to envision a model. This was inspired by the XT 500, for you to doubt the mind and thoughts of the creature is less than wise.